Tuesday, while lying on hot moist pads at my physical therapy clinic, I leafed through a fluffy women's magazine. (Funny how you might typically call fluffy things "girlie" yet a "girlie magazine" means something completely different.) A short article in the paltry health section caught my attention: apparently some study found that women are less trusting when our progesterone levels are cyclically elevated – suggesting that we are most paranoid when we are most liable to conceive. From an evolutionary standpoint that seems good for the species, but it doesn't seem like it could possibly be good for long-term relationships. Certainly it hasn't been conducive to maintaining my relationships for long hauls. Today a NY Times article about author Anne Carson ended with, "... Ms. Carson lives by herself most of the time, but says she does not mind loneliness: 'Loneliness is not an important form of suffering.... It's undeniable, but it's just not significant.'" I decided to add Carson (4 years my senior) to my overwhelming reading list when I read the excerpt from her book Glass, Irony and God: "Everything I know about love and its necessities / I learned in that one moment / when I found myself / thrusting my little burning red backside like a baboon / at a man who no longer cherished me." Carson and I are of the first generation (and still counting) failed by the promises of the sexual revolution, I think. I recently went out with a man who told me that he preferred dating "older women" (the twit was actually a few months older than I – it was our final date, by the way). They were, he said, more "realistic" – by which he meant that we thrust our burning backsides while no longer hoping affection to be coincident. I suppose that's a little less evil than lying about esteem in exchange for a little burning backside. I suspect that the last man who took that tack with me would have thought twice had I been blogging publicly then. So! There's another chit in my mental side-by-side comparison of the pro's and con's of online journaling. I last said that blogging about blogging was boring me – and that there are a lot of reasons to blog. But, there may be a really good reason not to blog. Over 16 (!) years ago, my friend Joe, then the head of the department I was working in, taught me how to use email. He said, "Never email anything you wouldn't post on your office door." It's a great rule to follow, and I should more often. "...results reveal a certain naiveté in how most bloggers think about persistence and how it operates in networked environments such as the net, where information is constantly cached. As blogs become more pervasive and their audiences grow, the ever-persistent nature of entries and the direct link to defamation and liability are likely to become even more of a burning issue." The issue isn't really new – throughout history, writers (and politicians) of every ilk have felt the repercussions of their statements. As it should be. To apply lessons of earlier forms of communications, we need to remember that statements online, whether in email, on a website, or in a blog, are also subject to scrutiny – we need to think of the internet as a giant recording device, no longer an inscrutable ether or a well so deep we never hear the plink of a tossed pebble. I am now envisioning whatever I say broadcast much as Major Burns' cooings that Major O'Houlihan had hot lips were cruelly broadcast across their community. Ever since I was the Chatchka Empress* at Wolfram Research, I'm always on the lookout for the perfect giveaway. David Weinberger writes from SXSW (I also used to work with SXSW prez Roland Swenson at the defunct Moment Productions recording label, speaking of less than x degrees of separation) that Friendster's chatchka is a condom – how perfect is that?! 2. Empress: since the Fab 5 have worked their way into my heart, I'm never calling myself the queen of anything again. I love this photo that her boss took this afternoon – she had the same expression on her face when, at 3, she offered her dad and me her very special dirt-and-oak-leaf 'salad'. I've started a 2nd project to go in a strange little window that looks into a coat closet from my house's front porch (what were they thinking?). The illogic of that window has always bothered me – I'll be happier with the entry once I install a colorful privacy glass panel, especially after I've set up a timer to light the window from the inside. 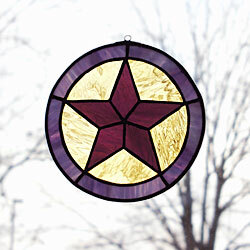 My first project now hangs in my office window. Like most Americans who were deeply affected by the Trade Center Towers collapse, I've been slowly recovering from mourning. Like everyone in mourning, small things touch off memories that re-trigger grief. There are fewer and fewer triggers the further from tragedy time takes us. 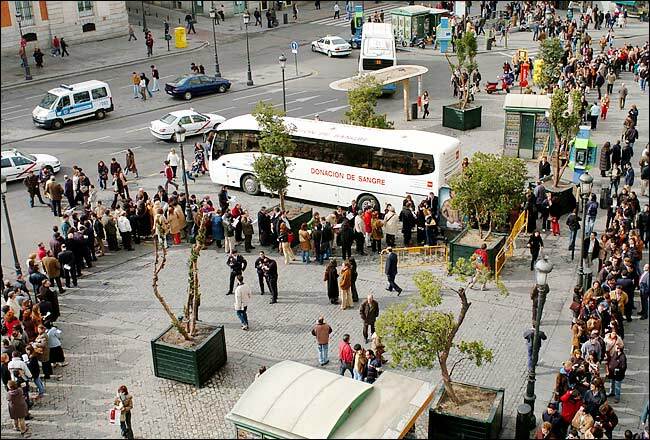 This morning, in spite of all the sadness evoked by the NY Times story about the Madrid train bombings, only the photo of hundreds lining up at the Donación de Sangre bus brought back tears over September 11, 2001 – specifically the sickening realization that, of thousands of people caught in a giant building collapse, there was no one to give blood to. When my co-worker apologized for 2 years of her tortures, I only felt uneasy. I've never much liked apologies. I'd really rather see a change in behavior than hear an apology. I recognize now that my adverse reaction to apologies ripples from my childhood. My mother's apologies have always had a hook hidden in them – like the writhing worm my little sister had to thread on my line when our father took us fishing. My mother's apologies always float for just a minute before they sink in murkiness, leaving her unfortunate beneficiaries feeling a little muddy. The typical reaction to qualified praise is not dissimilar. "That's great, but..." – the first phrase buoys you up, while the conjunction yanks you under. Some 3 months ago, my mother apologized for the uncontrolled rages she directed at me through a stinging leather belt when I was 7 and 8. She would say that she was too young then: 26 or 27. She told me that if she had it to do over, she would do it differently – that she's learned from the way I'd parented her granddaughter. Praise so unpolluted nearly took my breath away. I'd wanted to slide into it and let it carry me a while. Then, meaning to sting again, she snatched it back with, "But, you were a difficult child, Renice." This last apology was like all her others, with one difference: I decided it was the last time I would bite. * Better known as a 'fishy' apology? Or perhaps an apology with a hook? A woman who once worked for me hated the way I laughed. 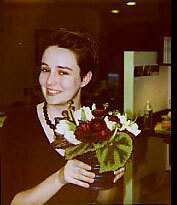 If I had liked her at all then, I might have had some sympathy for her – after all, in our tiny shared office, we were cooped up rather like factory-farmed hens. But I didn't like her: she was a trial, my own personal tribulation, a pestilence raging at biblical scales on a private stage. After 9- or 10-hour days working with her, I often went home to my family in tears asking, "What could I have done to her?" To her credit, after over 2 years of torturing me for reasons that had nothing to do with me, she apologized. Long before her apology, I practiced a releasing technique of sorts without realizing that that's what I was doing. Every morning before I opened our office door, I stood for a second outside the maelstrom, took a deep breath, and imagined myself swathed in a protective force field of white light. I didn't know anything about the New Age mysticism surrounding "white light", or anything about this particular type of meditation technique. All I knew was that the little quieting ritual helped me keep my sanity until Dustan came along. Dustan was a pre-med student employed in a clerical position by a nearby group. He occasionally stopped by our office to use our printer. Eventually he started chatting with me about printers and computers. His curiosity and excitement was a welcome contrast to the resistance I was meeting in my office. The woman I shared the office with never missed an opportunity to tell me how much she hated computers and that they were a passing fad in the graphic arts field – a sentiment shared at the time by a great majority in the graphics field, including the faculty in U of I's school of Art and Design. The student interns I was getting from that school were so resistant to new technologies that they couldn't seem to grasp basic concepts such as how to retrieve their files from our file server each day they returned to work. Dustan happened to stop by the office the day I was frustrated to my breaking point. Without the typical portfolio review or interview, I offered him a job as a graphic designer, and, a bit dumbstruck, he accepted. Later he went on to become an Art Director in NYC at companies like Forbes and AOL. But the year he worked with me, his energy helped remind me of the reasons I'd first gone into graphic design. It's been a week and a half since the stress-release workshop in NYC. My friend Joe says he can tell a difference – that I seem "more engaged". My boss says I've been looking angry the last few days. A co-worker from another department told me I seemed too subdued at a meeting recently and asked if I were sick. And my daughter told me, "things will get better" while she and I sat down to watch the Oscars together (850 miles apart but attached by cell phones). Funny... I think they're each right. My phone partner and I haven't used the method's technique patterns much during our calls, but we've still done a lot of releasing: sharing with someone who reciprocates is so much more therapeutic than one-sided sharing with a therapist.